Brick is everywhere! 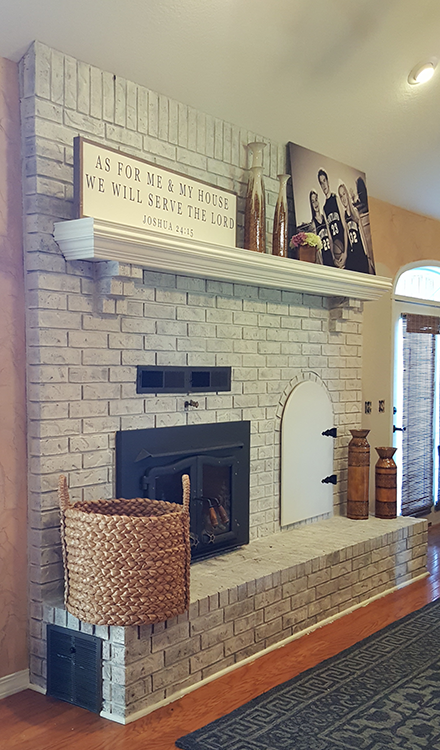 Whether it is the real thing, brick veneer or Masonite brick panels, there is a great appreciation for the substance and warmth that brick can lend. Lets talk about some of the ways we can use paint or other materials to give the brick a signature look. The photo above features a technique usually referred to as "smear". Pretty straight forward. Using mortar and a heavy rubber glove, you literally smear mortar over the brick. Some brick are usually left untouched. Keep a hose and a wire brush ready to remove excess if you are outside. A scrub brush and a bucket inside. Standard mortar mix is gray. You need to specify white mortar for a look like this. This is the first technique I will demonstrate. It is really a simple process, but it is PERMANENT! You might strip it one day and scrub it, but it will never look like your untouched brick. Translation: BE SURE BOYS AND GIRLS THAT YOU WANT PAINTED BRICK FOREVER. Having said that, here's what you do. Prep. Yes, you have to do this. If you are working inside, put down lots of plastic. Not just drop cloths. You need the waterproof quality of plastic. If you have an older fireplace or if you use it a lot, this will be a little more of a task than one that is rarely used. Vinegar and water is my favorite potion for most things and it works here too. If you are painting outside and encounter mold, use a mild solution of bleach and water. (Wear eye and skin protection. Scrubbing brick means spatters everywhere..pretend I'm your mother and just listen, ok? Wear the eyegear) Use a heavy duty scrub brush and go to work. Scrub all the brick and pay special attention to the mortar lines, dust really builds up there. Keep going over it with the scrub brush dipping back into your vinegar/water solution and changing the water as necessary until you feel like you have removed most of the dust and soot. To clean outside you may also need a little chemical assistance beyond the vinegar. TSP (trisodium phosphate) will loosed stubborn dirt and tree sap. Rinse. Rinse. Rinse. Now let it dry. Overnight is best, especially if your are going for full coverage. Paint. First, decide what you want the finished product to look like. If your answer is the top photo--full coverage, you're in for some time, but it's not hard. I also recommend getting a paint made for masonry. Elastodynamic (or elastomeric) paint is what you need. How's that for fancy talk? It just means that the paint is elastic; it expands and contracts with the brick and will be less likely to crack or pop off the changing brick. Inside, this may not be absolutely necessary. People paint interior brick every day with latex or acrylic paint and it works fine. I have found, though, that it's usually best to match the paint to the application whenever possible. If you are painting outside and you want full coverage, I absolutely positively with a cherry on top want you to use masonry primer and paint. This is a fair amount of work--and I'll bet you don't want to do it again anytime soon. For full coverage: You have your prep work done. You have selected your paint and the sheen you want. Semi or high gloss are the usual choices for painted brick. Your surrounding area is covered. You have taped off the mantle and any surfaces that meet up with the brick. This includes where it meets the floor. Even if you are a really neat, experienced painter, tape. You will be scrubbing the paint in to get into the porous surface of the brick and mortar. This isn't about finesse, it's about aggressive painting. Use a bristly brush, preferably a cheap one that you aren't attached to. A brush like this: cheap and well-used will work fine. The first coat is easier if you dilute the paint as much as possible. Check the label for the manufacturer's recommendation for thinning. 10 to 20% is the most common. The thinner the paint, the easier it is to get it down into the pores and mortar lines. You will NOT achieve full coverage with one coat. Probably not with two and maybe not with three. Be patient and allow time. Don't start this in the morning before you are hosting the book club that evening. It won't be finished, let alone dry**. After the first coat, don't dilute the paint. You will achieve full coverage faster and full durability if you apply it full strength. (Of course, if the paint in your bucket starts thickening up, add water a little bit at a time until it gets to a workable state. Or use a spray bottle and spritz the surface of your paint in your containter occasionally to keep it from thickening from evaporation.) Allow to dry between coats. Read the ESTIMATED drying time on the can. Since times vary greatly between products, I can't tell you how long to wait. If you are in doubt press your finger against the surface. If there is ANY tackiness, wait. Once you have all the surface covered with no brick showing through, you are finished. For a "Wash" or transparent color. You really are just doing the first steps of the process above. EXCEPT, you get to CHEAT! Yes, you have permission. Normally you would never want to thin paint more than the can says to: it destroys the integrity of the bonding properties. (In English, it won't stick if you water it down too much.) In this case, you may have to dilute it a lot in order to keep your look transparent and not blotchy. * Make a little sample batch. Start with 1 cup of water to 1/4 cup paint (4:1 ratio). Test this on a brick and see if it is enough coverage. If not, you have two options, do multiple coats or add more paint to your recipe, 1/4 cup at a time. Keep track, that will be your recipe when you mix a larger quantity of paint for the project. If you end up needing just one more addition of 1/4 cup paint, your ratio is now 3:1. So if you want a gallon of the recipe total, use 3 quarts water to 1 quart paint. Here is a video I shot of a client's fireplace I recently whitewashed. There is no verbal instruction. Just a little reference for you. This client wanted what I would call a "semi opaque" wash as you will see in the before and after photos below. Please note: In this video, I did not tape off the mantle. That is because, as you can see in the photo below, I knew it was getting a paint job..so in this case, it didn't matter. I gave directions for two levels of coverage. You might want something in between, or a combination of the two. The process is more or less the same. Fully cover some bricks, partially cover others. Add a lot of paint, then wipe it back or use sandpaper over the surface when dry to distress the edges. (See photo below.) Experiment. Start with less, then build up more paint until you get the desired look. The examples I have shown are actual brick. You can use a similar technique on faux brick or Masonite panels that look like brick. Actually, it's much easier, because it is probably smooth enough to roll the paint on. The background in the photo below is painted "brick" panels in my laundry room. I rolled on two coats of satin paint, then ran a power sander quickly over the surface to distress the bricks. I love the look. So that's how we paint brick. Remember...painted brick is FOREVER! So be sure it's what you want..then go forth bravely and paint! Stay tuned to share my experience trying out some Limewashing and "Smearing" with mortar.